Our unseasonably cool summer (okay, late spring) has left my tomato starts and basil shivering in their beds, drooping from a low-temperature hangover. This, while my garden’s leaf master, rhubarb, stands tall, beaming under the cloudy, inclement skies of a Puget Sound marine layer, bulking out as a bumper crop of grand proportion. Looking to the cupboard for some spreadable fruit delight to dress up my dry toast, I found that the larder was low. Down to a couple jams jars labeled with smeared dates and questionable freshness, I called upon said bumper crop of rhubarb to rescue me from a potential unsavory encounter with a past due date or stale snacking experience. A match made in taste-bud heaven: a little strawberry-rhubarb jam on a slice of Macrina Bakery raisin bread. I borrowed a strawberry-rhubarb jam recipe from Mes Confitures: The Jams and Jellies of Christine Ferber. What I like about her technique is something I’ve always done because I never used bottle pectin and it help solidify the fruit mixture; you let the fruit and sugar rest for a day or so and in doing so, the sugar draws out the juices and preserves the fruit’s shape and structure, much like salting something. (Lutefisk can be handed down for generations.) It usually takes me about three days to make jam, a very no-big-deal three days. Day one: It sits, absorbs sugar. Day two: I let it simmer gently, shutting off the heat to let it evaporate some. Day three: I heat it again to simmer and know it’s ready when the jam congeals as two separate drops off of my stirring spoon. Then, I bottled it up, using small jars. It takes a few steps; but I find it’s a very small price to pay for sunshine in a jar, especially when its namesake is so reluctant to appear. 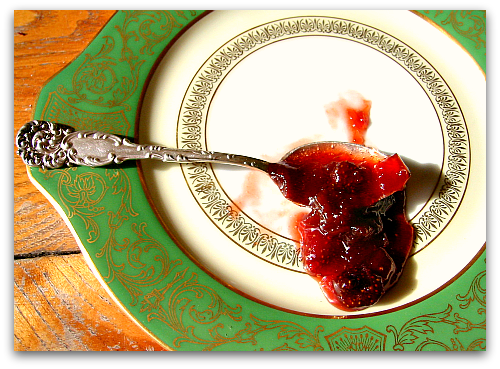 Here’s the full text recipe: Strawberry-Rhubarb: The Fred and Ginger of Jam. Frickin’ summer. I am so PO’d. Today was nice but it’s mid June for God’s sake. At least the rhubarb likes the weather. What a savior you are! Thanks for your great clarity around ripening peaches. I am particularly glad to hear I don’t have to ripen them all at once .